As promised, here's the entry I alluded to yesterday. All I can say is - thank God for Google. Sorry again for the fuzziness, but the detail to your right is from a painting I posted yesterday by an artist known as "Master of Wilten." The painting depicts the Presentation of the young Blessed Mother. Curiously, these two animals seem to be a secondary focus of the painting in the central foreground. This struck me as odd, so I did a cursory search thinking I'd find a quick explanation of their significance. No dice. I located the artist of the original painting and, of course, he's anonymous, himself. He is presently known only as "Master of Wilten" and lived in the 15th century. Nothing more is known about him other than the paintings he left behind in his workshop detailing scenes from Our Lady's life. Go figure. So back to the painting I went. At first, I thought the two animals were a dog and a lamb (especially considering the latter's elongated muzzle and white coloring). However, the tail of the supposed "lamb" extends much longer than any lamb I've seen. That tossed "lamb" out the window. So I looked up the possible symbolism of dogs at the Presentation of Our Lady. The only recurring reference was that these two animals were "Barocci's cat" and "Bassano's dog." That didn't sit comfortably with me since neither looked like a cat. Dutifully, however, I researched both Barocci and Bassano in the hopes that I could glean what their chosen symbols represented. Federico Barocci, it turns out, just really loved cats. No symbolism there. He'd sneak one into most of his paintings, which is why any cat cropping up in random works of art became known as "Barocci's cat." This reminds me of Trigun's cat, but hey... that's a whole different story. Jacopo Bassano was similarly inclined towards dogs, but upon further research, I learned that dogs were associated with fidelity and contemplation. What's more, two dogs quarreling sometimes signified dueling theologians (kinda like Plato and Aristotle pointing up vs. down). Ah ha! Another piece of the puzzle falls into place. Just to be on the safe side, however, I tried to find out if these two artists had any sort of feud. No such luck. I also did a quick search to see if either had been tutored by the same guy. Also no luck, though I did note that, while Bassano studied under an artist by the name of Titian (who also enjoyed painting dogs), Barocci trained a pupil who had the same name as one of Bassano's sons. I couldn't locate proof that the two men were, in fact, the same person (since Giovanni's last name, Battista, was ridiculously common at the time), but it was still interesting enough for me to note. However, since I was burning rubber through search engines quicker than the ever-balding tires of the General Lee, I shifted gears and did a Bible search for the word "dog." I wanted to find biblical references to the animal in the hopes of gaining some insight into its literary value. Apparently dogs are mentioned in several places throughout the Bible! Go figure. That's right! 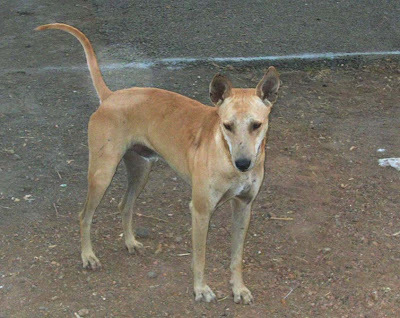 Pariah dogs look EXACTLY like the one portrayed in the above painting! This wasn't just ANY dog... this was a pariah!!! So I went and did some research on pariah dogs. It turns out pariahs were associated with evil in the Old Testament because of their savage and wild behavior. So with half the puzzle making sense, I decided to figure out if the other dog's breed held symbolism. I started with what I thought the dog looked like - a toy poodle. I cycled through the history of how poodles came to be bred into their "teacup" sizes so wealthy Englishwomen would be able to carry them around as personal hand-warmers (I wish I were kidding). This article mentioned, however, that these pups didn't really begin to be "bred smaller" until the 1600s. That's a good 150 or so years after the puppy in question was painted. That ruled out poodles. So I went back to the drawing board and did an image search for "toy dogs." One of the first pooches to grace my screen once again looked like the subject of my confusion - a bichon frise! Immediately, I began delving into this breed and learned they are, in fact, descendants of poodles and are valued for their natural loving temperament and keen intelligence. Armed with this new information, I once again cycled back to the painting. The bichon is engaged with the pariah, but from their stance, the bichon clearly has the upper hand. Thus, I concluded that these two animals were symbolic of the fight between good and evil, with the "good" clearly outmatching the "bad." I was still slightly confused as to the prominence of these bickering animals. Instead of focusing on Our Lady, everyone (even St. Anne!) seems to be paying attention to the quarreling dogs. The Blessed Mother, for her part, also is casting an eye back to them! I admit to being puzzled, but then I realized my error. Little Mary is at the center of the painting. Though she is caught between the Temple and her people, she is ever-moving towards the Holy of Holies. She does not turn a blind eye to the struggles we on Earth endure. Instead, she acts as our mediary (Mary, Mediatrix! ), always calling us to follow her lead and walk towards God. In the end, good will triumph, and Mary's entrance into the Temple... Mary's acceptance of God's Divine Proposal... Mary's perfection which already embodies God before His willing Incarnation... all of that brings to pass the promises made by God to Adam and Eve upon their expulsion from Eden. A woman would come who would, indeed, bear forth a child that would forever strike at the head of sin. Through her, all Life would spring forth, and all Life would return back into the Hands of its Creator. Ah, the mysteries of Mary!